This is a great example of how you can use wall dividers and keep kitchen items out of sight and maintain a cleaner environment. When there are lots of guests to serve, serving them quickly and at the same time is as important as clearing the tables in a timely fashion after guests finish their meals. Proper timing will make sure that your guests are completely satisfied. 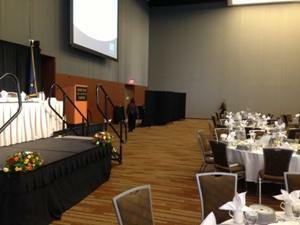 Think about how important it is to keep food items hot before serving dinner at a banquet or conference. Guests appreciate meals served the way they are supposed to be whether it be warm or cold. So how do you do it all when your kitchen is not just steps away? 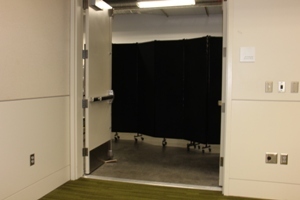 Wall Dividers can be a big help! You can certainly make your server’s lives easier by using just one or two partitions. Your guests probably won’t notice but if they don’t see dirty dishes, glasses or beverage trays they will enjoy their dinner more than if they have to see those eye sores. Wall dividers keep trays hidden. 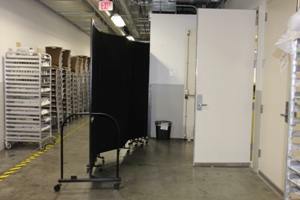 One room divider in the kitchen will help you to offer a nice traffic flow for servers. As you can see in the photo, you can also keep your doors open because the divider hides trays of food, dishes, and food prep. Leaving the door open makes it easier to carry trays to the banquet hall. Nothing like seeing food and food preparation in the kitchen. Regardless, it’s just not appetizing to see. 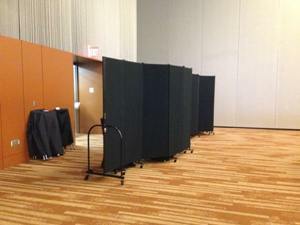 During dinner, one wall divider is set up where the servers enter. Beverages are kept in a convenient place and are closer to the tables. The wall divider creates a great spot for beverages and extra and even dirty dishes. Wall Dividers keep items covered. Dirty dishes can be kept out of sight. Wall dividers act as a temporary room for kitchen items. Items stay hidden behind the divider to keep a clean atmosphere in the dining area. 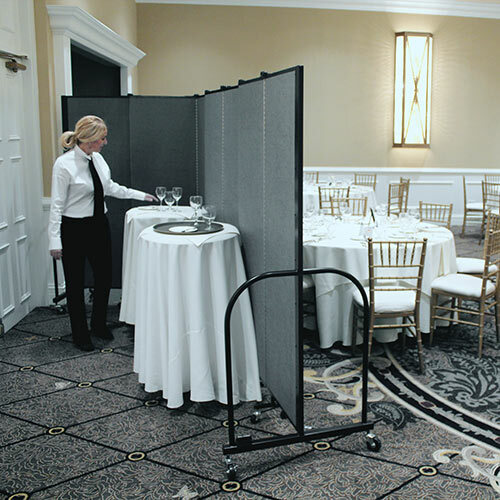 In the hospitality industry where service is extremely important, wall dividers can help to create a barrier and keep what’s in your kitchen for a more pleasurable event. Wall Divider in the distance.